Barbara Slate has created more than 300 comics for the biggest names in the industry. This book rose came from teaching her workshop, and takes readers step-by-step through the process of creating a graphic novel. The book doesn’t bog down with extensive descriptions on how to do any of the steps, and Barbara is quick to tell readers the only way to learn is by doing, and guides them – time and again – to try the techniques she outlines throughout the book. The guide is filled with outstanding tips on everything from plotting to inking to building characters. Barbara even takes the time to tackle the tough demons of writer’s block and the critical inner voice. She’s walked the tough road of an artist and shares some great tips of her success, as well as some of her toughest lessons. What I liked most about this how-to book is the depth Barbara gives to the actual writing process. 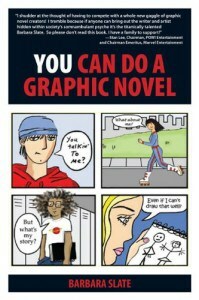 She expresses how graphic novels are stories, and it’s critical that they progress in the same engaging tone and pace, giving examples and tips of how to spark creativity and be a better writer. I highly recommend this book for anyone who is even thinking about trying their hand at a graphic novel, and it would make a great gift for any age, though the reading level is probably a little much for beginning readers. Jen Greyson writes supernatural thrillers and corporate training guides and considers it a good day when she manages not to mix the two. Her mama-sized survival tips and samples of her current novel are on her blog http://TheSurvivalMama.com.